Q. What is the Simply Manischewitz Cook-Off? A. Now in it’s third year, the Simply Manischewitz Cook-Off is a fun and entertaining recipe contest. Create your favorite kosher entree or soup recipe that can be made in one hour or less and submit it here. The contestants with the top six recipes, as determined by a private panel of judges, will be sent to New York for a 2009 Cook-Off showdown where a winner will be declared. Q. What can you win? A. The winner receives state-of-the-art GE Profile™ Stainless Steel Kitchen Appliances including a single Trivection® Wall Oven, Built-in Advantium® Oven, Profile Stainless Dishwasher, 36″ Gas Cooktop, 36″ High Performance Hood and Built-in Profile Refrigerator. PLUS, Manischewitz throws in a bunch of free products and a $5,000.00 check! Prize includes installation that does not require structural alterations to existing kitchen layout. Overall, more than $30,000 worth of prizes will be awarded in the contest. All finalists will win a trip to New York City for the exciting Cook-Off showdown. Q. 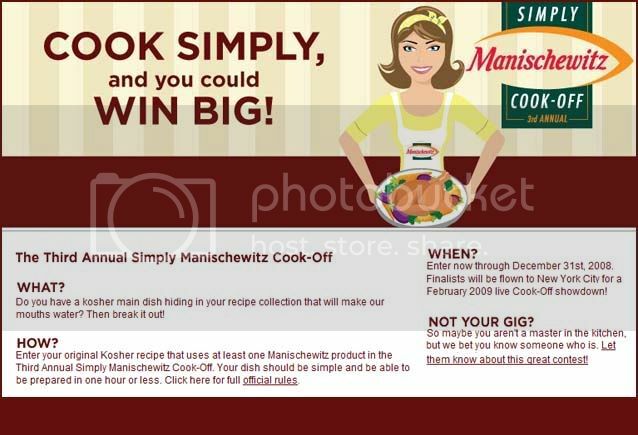 Who can enter the 3rd Annual Simply Manischewitz Cook-Off? A: This contest is open to all amateur cooking enthusiasts in the 50 U.S. states and District of Columbia who are 18 or older as of September 2, 2008. Q. What should my recipe include? A. Recipes are limited to 8 ingredients (that’s to keep them simple! ), not including salt, pepper and water. All recipes must be kosher and include at least one Manischewitz product. Q. What happens to my recipe once it is submitted? A: A panel of judges will review all recipes and select the top 15 to be prepared in the Manischewitz test kitchen. Six finalists will then be selected to move on to the Cook-Off in New York City. All submitted recipes become the property of Manischewitz and can be used in any promotional materials. Q. What is the judging criteria? Q. Who pays for travel to the cook-off? A. A 2-day/1-night trip to the finals will be awarded to the 6 finalists by Manischewitz. (Please see the Official Rules for complete details on trip). Q: What happens at the Cook-Off Finals? A: The finals in New York City will be a live event. All finalists are given 1 hour to make their recipe which is then presented to and tasted by the panel of judges. Q: What is different from previous Simply Manischewitz Cook-Off contests? A: This year, there will be no regional Cook-Offs or online voting for a people’s choice. New for this year, the Manischewitz test kitchen will be preparing your recipes to see who will become finalists. Q: What if I’m not sure my recipe is Kosher? A: Don’t get all faklempt! Just click here for an easy guide to see if Bubbe’s recipe fits the bill. For any other questions, please read the Official Rules.